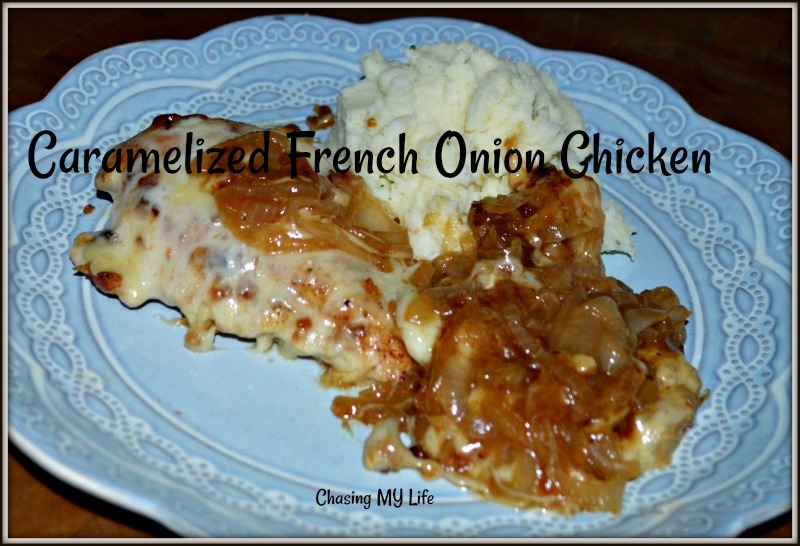 This is a delectable Caramelized French Onion Chicken that is juicy, a one pan meal and makes super saucy caramelized onion gravy. Oh and did I mention cheesy? 3 kinds of cheese that also make it ooey and gooey! Preheat oven to bake at 400°. In a large oven-safe skillet over medium-high heat, melt butter. Add onions and 3 tablespoons beef broth sautéing onions for 3-4 minutes until translucent. Continue to cook, stirring occasionally so the onions don’t burn, for about 15 minutes longer until browned and very tender. Use tongs or a fork to transfer to a bowl and cover to keep warm. While onions are cooking, prepare the chicken by drizzling with oil, then seasoning with the fresh ground Himalayan sea salt, fresh ground black pepper (to taste) and Italian herbs. Once onions have finished cooking and are removed from the pan, cook chicken for 4-5 minutes on each side until browned on both sides (chicken may not be fully cooked through yet, that is okay). DO NOT clean out the pan between the onions and chicken. Transfer chicken to a plate cover and keep warm. Return the onions to the pan. Sprinkle flour over the onions and stir for 1 minute over medium-high heat. Add beef broth and continue to cook, stirring throughout, until mixture comes to a boil. Return chicken to pan and spoon some of the sauce over each piece of chicken. Top chicken with one half slice of provolone each, then one half slice of Muenster, then ¼ of the parmesan cheese. Transfer skillet to your preheated oven and cook for about 10 minutes until chicken is cooked through completely and cheeses are melted. Spoon some of the onions and gravy over the top of the chicken, garnish with thyme or parsley and cracked black pepper, and serve immediately.